We regret to inform you that [Company XYZ] has decided to cancel the tender for [project name] due to [specify reason]. Please consider this letter as an official cancellation notification with tender cancellation procedures to follow. We are sorry for this decision and the lost opportunity to do business together. We look forward to future cooperation in other projects. 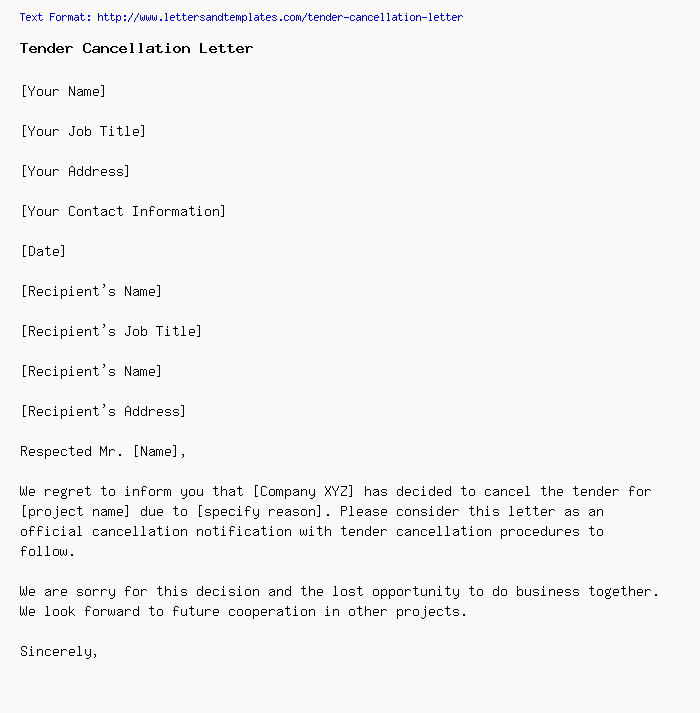 Please note that [Company XYZ] has decided to cancel and withdraw the tender for [project name] due to [some reason]. We appreciate your interest in the tender and your decision to work with us. This is truly a lost opportunity. However, we remain interested in doing business together in future ventures should the occasion arise.